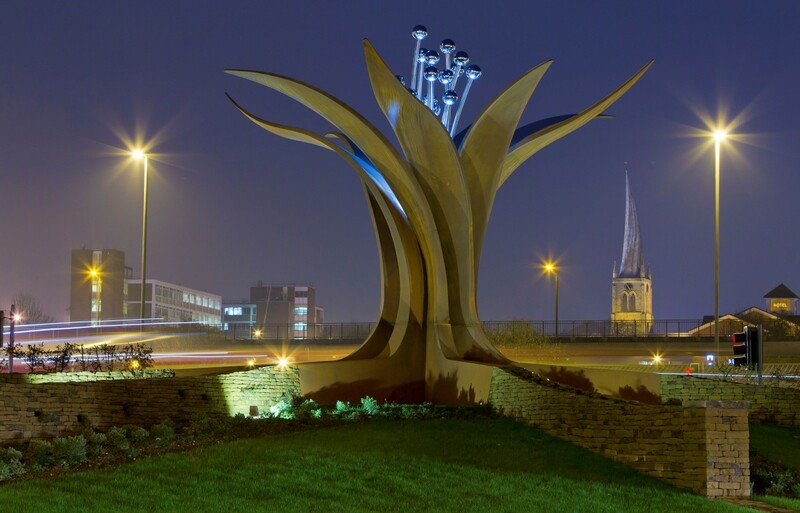 As part of a design and implementation competition held by Chesterfield Borough Council, Ryder Landscape Consultants were invited to produce a design for the existing Hornsbridge Island roundabout that would enhance an important approach into Chesterfields Town Centre. Funded by the European Regional Development Scheme and Barratt Homes, this was part of the Gateway Enhancement scheme that sought to improve two major approaches into Chesterfields Town Centre, one of them being Hornsbridge Island. We won the competition with our entry ‘Growth’ in collaboration with NT Killingly and Melanie Jackson Designs. The design incorporated a sculpture designed by Melanie Jacksons and was complimented by dry stone walls and structure planting all symbolising Chesterfields industrial past and heritage.